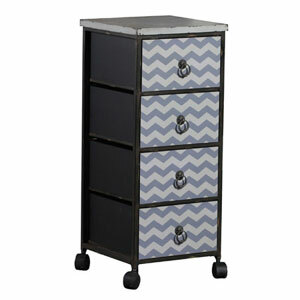 The Grey Chevron Wheel Chest is perfect for adding mobile storage to any area of your home or office. 4 Drawers provide ample storage space for toys, paperwork and other items. A ring style drawer pull graces the front of each drawer. The grey chevron distressed finish will complement a variety of color schemes and decor styles .